Here comes the innovation from the domestic manufacturer, iBall mobiles has officially launched a new Android tablet in the Indian market named iBall Slide Q9703. The company has added this latest tablet to its performer tablet series, which runs on Android 4.1 Jelly Bean OS that delivers a smooth Android experience. The director of iBall had a few words at the launch saying that, it is an era of larger screens and astonishing displays. The ultra resolution and retina panel on quad-core processor and an octa-core GPU of the device will surely provide terrific performance and stunning viewing experience for their consumers. This would be a perfect choice for those who want to pick up a tablet around the Rs.15 K price point and look out for a SIM card option to make calls. The iBall Slide Q9703 price is slated at INR 15,999 in India. The iBall Slide Q9703 will surely compete with the similar ranged low-end models in the Indian market and offer big screen installed with Android 4.1 Jelly Bean OS. To deliver high performance and multi-tasking ability, the device has 1.2 GHz quad-core processor, Octa logic GPU and 2 GB of RAM. Store all your favorite stuff like music files, images and games as the device houses a user internal memory of 16 GB. Along with this, the dual SIM device packs an external memory slot, which can be expanded up to 32 GB via microSD memory card type. This tablet will deliver an optimum battery backup while browsing and playing games by its use of the immense 8000 mAH battery. The 5 MP rear camera supports an impressive image recording resolution and makes sure to deliver impressive photographic working experience wherein, user can possibly capture his/her prized memories and capture high clarity images. 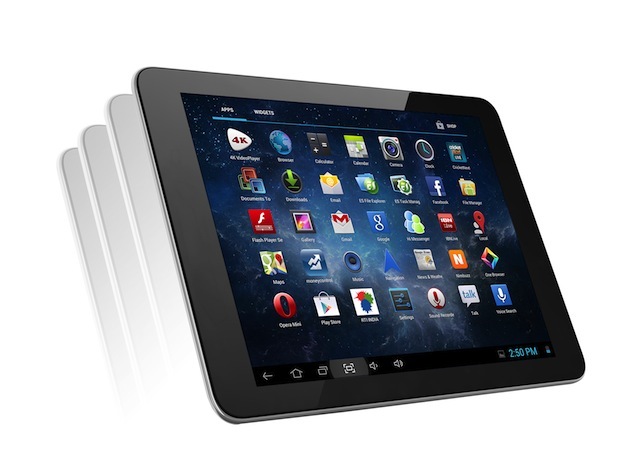 The tablet also has a front facing camera of VGA resolution capable of making video calling and video chatting. The iBall Slide Q9703 sport a 9.7-inch Retina Panel with QXGA HD display and a good resolution of 2048 × 1536 pixels, which delivers great viewing experience while browsing web content or watching videos/movies and even supports 4K Ultra HD videos with resolution of 4096×2160 pixels. The iBall Slide Q9703 features deliver a wide range of connectivity features like 3G via USB dongle and Wi-Fi and Bluetooth to ensure the users use the internet with high speed and allow faster browsing, downloading attachments and watching streaming videos with excellent quality. The latest iBall Slide Q9703 pictures are available on various mobile web-portals that look mind-blowing. To deliver fun and entertainment, the tablet is furthermore pre-loaded with options like audio, video player supporting various formats and a 3.5 mm audio jack. On the other hand, the iBAll Slide Q9703 is pre-installed with amazing apps, games and document viewer. The premium rear camera is even combined with auto focus option and G-Sensor that delivers the best photographic experience. Now this impressive manufacturer have rolled out a new gadget, which is called the iBall Andi 5L it's available with a price tag of INR 10,490.